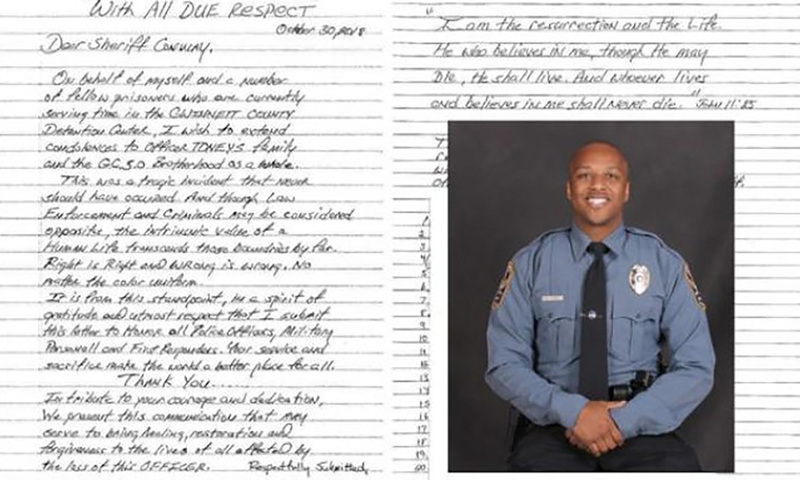 A group of Georgia inmates penned a heartfelt letter to police in support of law enforcement in the wake of the death of of a Gwinnett County officer. Officer Antwan Toney was killed in the line of duty Oct. 20. The Gwinnett County Sheriff’s Office posted the handwritten letter to its Facebook page Friday. The letter goes on to thank all police officers, military personnel and first responders. “Your service and sacrifice make the world a better place for all,” it reads. The letter appears to be signed by at least 20 inmates, though the Sheriff’s Office withheld their names to protect their privacy. Toney was 30 years old when he was gunned down last month. His killer was shot and killed by police. The letter expresses sorrow, not anger or hate at Law Enforcement. Rest easy Brother.